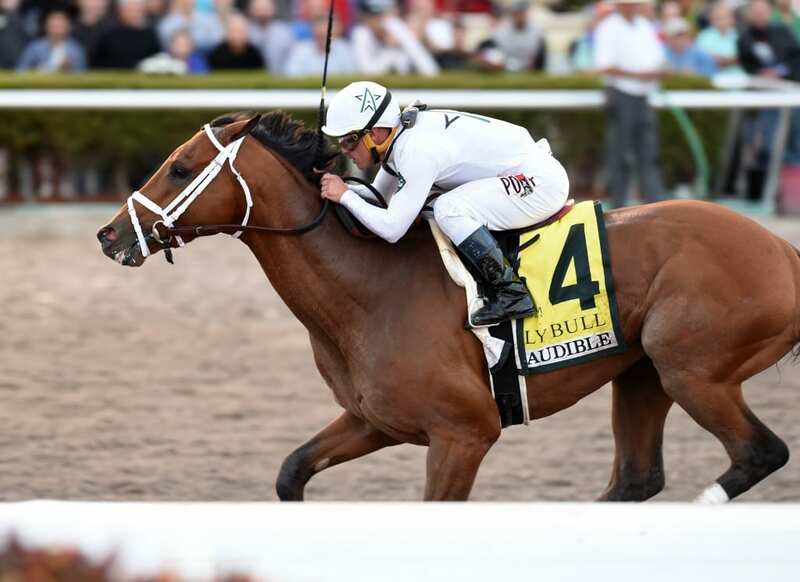 Audible won the Holy Bull at Gulfstream Park, here, and the Florida Derby. Photo by Lauren King. New York-bred Audible (6 first-place votes, 381 points) has moved up to second in the latest NTRA Top 3-Year-Old Poll following a three-length score in Saturday’s $1 million Xpressbet Florida Derby, while Ireland-based Mendelssohn (9; 285) jumped to third on the basis of a track-record, 18 1/2-length win in the $2 million UAE Derby. Poll results were released today by the National Thoroughbred Racing Association (NTRA). Bolt d’Oro (28 first-place votes, 429 points), expected to run in Saturday’s Santa Anita Derby, retained the top spot in the NTRA Top 3-Year-Old Poll. Owned and trained by Mick Ruis, Bolt d’Oro was a multiple Grade 1 winner at two and won his 3-year-old debut in last month’s San Felipe Stakes (G2) at Santa Anita. His chief Southern California rival, McKinzie (3; 237), first across the wire in the San Felipe but disqualified to second for bumping in the stretch, dropped to fifth in the poll upon news that he will miss the Santa Anita Derby. Oaklawn Park’s Rebel Stakes (G2) winner Magnum Moon (259) did not race but dropped to fourth as the result of the ascendance of Audible and Mendollsohn. The remainder of the top 10, in order (with poll points): Good Magic (200), Justify (172); Noble Indy (170); Enticed (128);and Solomini (84). In the NTRA Top Thoroughbred Poll for horses of all ages, West Coast remains a clear leader among U.S.-based horses, having earned 25 of 30 first-place votes, and 428 points overall, after finishing second in Saturday’s $10 million Dubai World Cup. The 2017 Champion 3-Year-Old has earned $3.6 million this year with runner-up finishes in the world’s two richest races, also including January’s $16 million Pegasus World Cup Invitational. Eclipse Award-winning Champion Female Sprinter Unique Bella (4 first-place vote; 315 points) remains second in the rankings. Trained by Jerry Hollendorfer, the daughter of Tapit is being pointed toward the Grade 1 Apple Blossom on April 13 for her next start. Santa Anita Handicap hero Accelerate (1; 272) moved into the third spot as reigning Champion Dirt Female Forever Unbridled fell to 10th after not firing in the Dubai World Cup. New to the top 10 this week is crack sprinter Mind Your Biscuits (243), who won the Dubai Golden Shaheen for the second year in a row. Rounding out the top 10, in order (with first-place votes; overall poll points), are: World Approval (147); Roy H (1; 143); retired 2017 Horse of the Year Gun Runner (11; 124); Abel Tasman (109); Mubtaahij (100); and Forever Unbridled (91). Dubai World Cup winner Thunder Snow, who is based in the United Arab Emirates and has not raced in the U.S. since last year’s Kentucky Derby, got three first-place votes and landed at 14th overall.